Exclusive sponsor of the post-race brunch, with logo table tents at all tables. Opportunity to include marketing swag in runners’ prize bags. Opportunity to have live presence & speaking role at brunch. Free table for 8 at brunch. 4 complimentary race entries & beanies. Your logo on race marketing materials incl. website, posters, newsletter, social media, reaching 10K households. 2 complimentary race entries & hats. Your logo on race marketing materials incl., website, posters, newsletter, social media, reaching 10K households. Opportunity to have live presence at packet pick up. 2 complimentary race entries and hats. Opportunity for your company to sponsor and staff a water stop along race course. 1 complimentary race entry and hat. 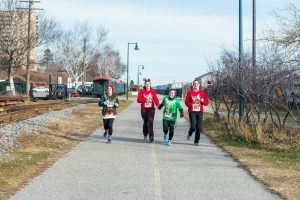 If you’re interested in supporting Holiday Dash Winter 5K this year please email Nancy Grant Advancement Manager, nancy@trails.org.